St. Teresa of Avila has been one of the most significant guides of my spiritual life since I was 17 years old. I began reading her very early in my life as a Pallottine and there are two moments – a dream and a time in prayer - that have connected me to her. With these I am both emotionally and spiritually connected to her, even though I don’t pray to her that much. 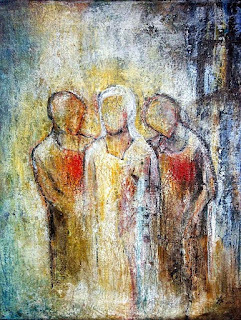 As we enter into Holy Week we are drawn by God to this state of quiet recollection in prayer as we contemplate Jesus in His Passion, as we “look upon the one they have pierced.” (Zechariah 12:10). The appropriate form of prayer is that of silent gazing. So I gaze on you – a silent gazing on the person of Jesus, a loving gaze and a total surrender to Him in which I put aside my own thoughts, my agenda and my struggles. I surrender my self-preoccupation and allow love for Him to be stirred, awakened within me in the silence. There is an invitation to turn a new page, to allow my heart to be “as a page that aches for a word which speaks on a theme that is timeless” (Neil Diamond); a blank page that is ready for a new word to be written by God. It is the promise made by God for the new covenant which we experience in Jesus. “Deep within them I will plant my law, writing it on their heart.” (Jeremiah 31) – the law that is written is His Word and His Word is Knowledge, Wisdom and above all it is Love. So what He seeks of us is a heart that is ready to have Love written on it in a new way. It is the sharpest of all instruments, diamond-like, that God uses for this writing so that what is written is an indelible carving that pierces through to the core as the Passion pierces through to the very heart of Jesus. This is where we flinch and turn away because we cannot bear our own pain and we cannot bear the full impact of the suffering of Jesus. “He had no special beauty or form to attract us; there was nothing in his appearance to make us desire him. He was hated, despised and rejected. A man of suffering, acquainted with grief. People would not even look at him, turned their backs, hid their faces from him, averted their gaze.” (Fourth Song Of The Suffering Servant, Isaiah 52-53). But if we are to experience full blessedness then we must not turn away; we must keep on gazing. Fr. Luigi Giussani, founder of Comunione e Liberazione, speaks about spending Holy Week simply looking on the face of Christ as the way to being changed or transformed. If we spend our energy in this sacred time getting caught up in our sins or wanting to be perfect we will end up tired and unchanged at the end of it. It helps to understand that when we gaze on Jesus we are gazing on the fullness of who He is. When we gaze upon the Crucified we are at the same time gazing on the Eternal Word, the Second Person of the Trinity, the Infant of the Incarnation in the stable, the Compassionate Healer and the Risen Lord – all of the expressions of who Jesus is provide us with the grace we need to continue looking at what we would rather avoid. Something more happens in the prayer of gazing – we are drawn to Him to enter into Him as He himself has entered into us so that we experience everything as He does. “Whoever eats my flesh and drinks my blood lives in me and I live in that person.” We see as He sees, understand as He understands that in the awfulness of suffering, in abandonment, He is not alone. We are not alone. The Father who seems absent is with us in hidden form sustaining Jesus, sustaining me, sustaining you! Entering into the experience of Jesus is an essential development in our interior spiritual life. Entering in and not staying outside. The Pharisees missed the point of Jesus because they always remained on the outside looking in, always questioning, judging, condemning. They would not sit at the table of intimacy and mercy; they would not come to the banquet. There are many things that keep us on the outside, including those things that kept the Pharisees outside but perhaps our greatest obstacles are guilt and fear. Guilt keeps us from coming to the table of mercy; we feel unfit, unworthy to take our place because we are ashamed. Yet, it was the worst of sinners who sat at table with Jesus in the gospel and perhaps this was made possible because they shifted their gaze from themselves to Him. Fear of suffering – the thought that God might ask too much of us - also keeps us at a distance, the prospect of unbearable suffering puts us off, turns us away, creates a resistance in us. Maybe we cope better when we are actually suffering. It helps to allow the Spirit of Jesus in His Passion to pray within us. In the garden of Gethsemane his distress, terror and agony give expression to ours; his darkness expresses ours; his struggle our struggle. In His abandonment on the cross he cries out our feeling of being abandoned by God – “my God, my God why have you forsaken me?” And because we are in Him and He in us, we are ultimately led to the moment of surrender to the Father which is the goal of all life and the point of all gazing, all prayer. Not my will but yours be done. Father into your hands I commend my spirit! Surrendering in trust into consummation, consolation, completion! Beautiful, so prayerful and thought provoking! and so condusive to prayer. Resting and staying with the meditation is a wonderful preparation for Easter.